Mamarazzi boiled a new type of soup. It's called Papaya Soup. Mamarazzi said she have not boil this soup for quite some time already. Taste weird. I don't like it much. But after awhile..taste grows on me. What's in it? Papaya which is half ripe, peanuts, "big head" vege and pork bones. Wanna try? 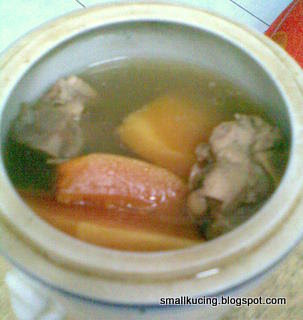 I haven't try boil papaya soup for my son yet... thankx for sharing! Oh, I love papaya soup. Should be nice if taken with cili padi in soya sauce. Must try to cook this soup one day!